As you may know I am not a big fan of traditional technical analysis. Why? You cannot win in the markets and make returns that can turn relatively small trading accounts into important amounts in a reasonable time (2-3 years). Let’s face it, this is what all of us want. Isn’t it? But you cannot do it with average cross-overs, indicators, pivots, trend lines or even the “modern” technical tools and indicators, all of which largely lag price, do not provide a trading plan, need to reconciled, etc. etc. But still the majority of traders rely on traditional TA alone, rather than studying and understanding price market structure, which is still considered very sophisticated, if considered at all. Today you have more tools, but still 95% of traders are loss-making. Wonder why? In short, the simple ways of the past and modern TA tools and indicators are not capable of consistently identifying low-risk setups. Plus the available reward/risk ratios are relatively low. There is no “promised paradise” in such conditions. Now if you add on top of this that the presence of automated Algorithms (Algos) has changed the markets in the last 20-30 years, traditional TA looks less useful than ever. What can you Do by Knowing Price Structure? You can identify level where participation from Algos is expected and then test those areas. These are areas of low-risk setups that can be timed in the smaller timeframe in a totally procedural fashion. I call this technique the FibStalking Timing and I have authored it. Sounds complex or impossible? Not at all. When you master price structure analysis based on the effects of algorithms (Algos), your trading gets pushed to the top…to the level of the Elite 5% of professional traders, who make money consistently. Becoming expert in recognizing effects of Algos on price and taking advantage of it is not difficult. Anyone can do it. There’s just a specific process a set of tasks or “formula”, if you like it, that you have to follow. The playing field is completely level on this matter. People I work with come to me telling they have never witnessed my method. Trading based on effects of Algos on price is little known, if know at all by retail traders. A lot of unique, effective and proprietary research has gone into this field to which I have dedicated over 10,000 hours since 2006, almost half of my total market exposure of 18,000 hours. I am an IFTA associate with 3 published papers and a 4th one to be published in July. Trading is difficult only if you try to trade according to non-grounded market behaviors. TA has nothing to do with market behavior and price structure. An indicator or signal derived by one or more indicators are only representation of statistical tables of failure and success with a random probability. I suggest the full series of webinars on FXStreet.com. See when you stop trading the non-sense you can be successful without having years of experience in the markets. And actually the lesser the experience, the easier is to grasp the counter-intuitive concepts in the FibStalker Methods Coaching Program. Can You Really Make it? My honest and helpful suggestion for you, if you want to start or re-start in trading, is to have a look at the benefits of the 7 months Program, and what it means for your trading. You can learn how to identify levels of potential participation from Algos and then how to time the reversal setups procedurally, with no initial money at risk and only after confirmation. It does not get better than this. It is the market action itself “sucking you into” a valid position, aligned with the Psychology of the Markets. Plus you will learn to use proprietary tools and advanced techniques like the FibStalking Timing. If you want to learn a complete approach to professional trading, including Advanced timing, analyzing and finally understanding price structure and what you can expect and anticipate on all timeframes, performing price discovery to know what is likely to happen consider joining my May 2015 session starting on Saturday May 30, 2015. Learn to identify and validate solid, low-risk trading plans, write your own trading system based on the proven components that I will provide you with. In the program I will also help you finally installing a mental model to become a consistent trader. You just have to know what the formula is and then follow it. I am making this formula available to a growing number of satisfied traders and at a price and with value that you will never seen again. As usual, let me know what you think by leaving an email at: fibstalker at gmail.com or a post on my blog. Below the link to my newsletter if you want to learn more about my methods and my edge in the markets. I often find myself and other traders and students I work with to never forget that the Market can do Anything. 2) incorporate proper and enhanced risk management so that the possibility of 1) happening is low or non-existent — a level of risk management that the majority would not be ready to accept, like exiting half of the position once the gain on the position reaches a level where it equals the trading risk. Thus I believe the majority of retail traders do not understand or realize that you *MUST* cope with the master principle that “Market can do Anything”, while I often hear words like “expect”, “assume” and even “know” that the price can do this or that. Words are powerful, and you should be very careful because you need to *think* something before you say it. And if you think you can expect, assume and even know what price is going to do next, well…. you will be lost — statistically and practically becoming part of the 95% group of retail traders who do not make money in the markets, but rather lose consistently. 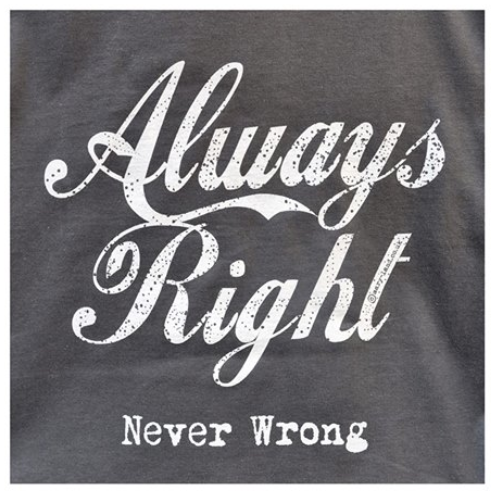 The market is “Always Right”, if you address it with a “fixed number of pip risk”, or any other type of assumption of expectations, you will fail. Full stop. On the risk side of things, the majority of traders also do not understand that this is a game that you win in defense. You must consistently take small risks and increase the reliability and expectancy of your method. 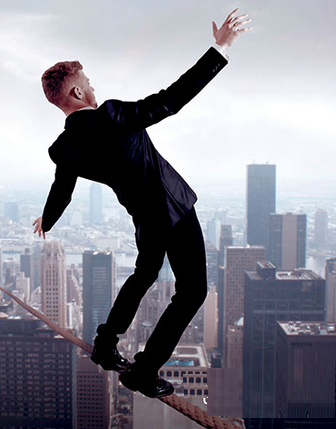 Risk management is a constant and there are ways to improve it. The problem is that you cannot just avoid optimizing risk because you only have access to a method that — being based on traditional technical analysis — can only offer R/R<=3 trades with low probability of hitting the targets. This question offers me the opportunity — before I offer the answer — for some speculation on the way I think about trading. For me price analysis is a balances of forces. Typically when a level or area of participation by Algos is reached I wait for a confirmation. Basically the Algorithms on the smaller timeframe, driving the counter-trend move into the important level of participation, have to show me that they give the way to the larger timeframe. The larger timeframe wins often, but not all the time. And those time when it does not win, summed to the resulting highest reliability and expectancy that can be obtained by trading right at the FibStalker levels, adds up a lot! Both in the area of winners percentage and R/R values. “The way my method works is that when I get price into the level of interest, where I anticipate participation for algos on the larger timeframe, I look at what happens on the smaller timeframes. Imagine 1.26 like a potential barrier where sellers on the larger timeframe can come back into the market again. But nothing is guaranteed int the market. So at these levels I become more vigilant and switch to the smaller timeframe. To know whether shorts will be successful they need to be strong enough to win the buyers that have pushed the market higher in the last few days. There are two set of sequences of moves higher that matter at the moment: one on the 4-hour and the other on the 15min. What I do then is checking if and when these counter-trend sequences fail, as an effect of new shorts that can potentially come in into the markets at the 1.26. We all know all the information in advance and I use the FibStalking Timing Technique to verify where the 4-hour and 15min sequences fail, if they fail. So generally there are two scenarios: 1) the sequences fail and the FibStalking timing tells you the exact confirmation level (is a well-defined price level) that tells you when the counter-trend move is not valid any more. That’s the time you must get involved in a short. Using the confirmation level you get involved in very good spots with high R/R and only after confirmation. This is why trading with the Algos is so convenient and traditional TA is not capable of offering such high R/R trades. On the other hand it can happen that the counter-trend sequences on the 4-hour and 15min remain intact and no-one shows up at 1.26. In this case you don’t have money at risk and the market can do whatever it wants. I will just wait. I only get involved in the markets at my own conditions (because after you are in the market can do anything). Now the good point is that when the counter-trend move fails below or above a FibStalker level, price momentum in the direction of the trade is strong enough to generate a free-risk trade. If you understand trading and risk management, you know that generating a free-risk trade from a low risk retrace is your job #1 as a trader. And that’s what I attempt to do. Once I have a free-risk trade I also have a free mind and I can go to think to something else. Because either the market hits my swing profit target or closes me at breakeven minus costs and slippage. PS: I teach the mechanical and totally procedural way to time FibStalker levels like the 1.26 in the EUR/USD in my multi-month Coaching Program. Drop me an email at fibstalker at gmail.com and ask for information. Last week I held a Webinar for FXStreet.com. 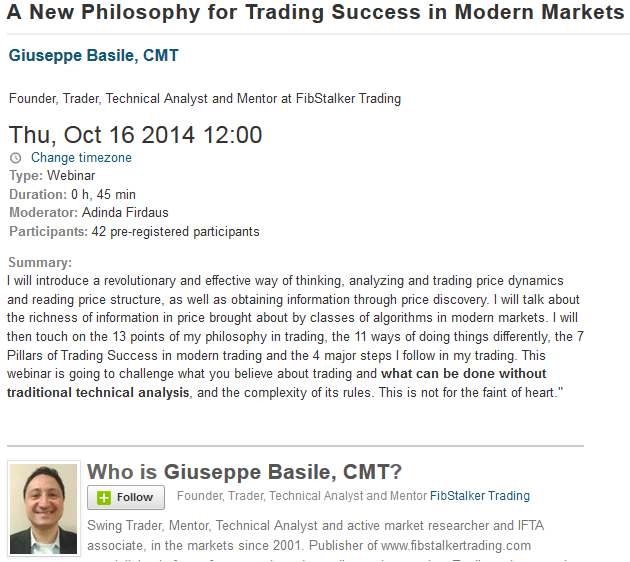 The title of the webinar is “A New Philosophy for Trading Success in Modern Markets“. In it I explained how badly do we need a new Philosophy to trade successfully the markets nowadays. The webinar also covers the content of my Workshop I presented at the Toronto MoneyShow last Thursday. The content of this webinar is important. Why? Well, if you look at the results of the average trader, as well as the majority of traders, you would immediately think that we are much in need for new and effective ways of analyzing, reading and trading the markets differently. Actually, over 90% of traders lose consistently in the markets. Moreover, 22% of Forex traders do not use any kind of hard stop (recent data shared from OANDA, one of the largest Forex brokers in the world). So doing things differently is key is a much needed substantial change. And as we do thing differently we must look at the reality of modern markets. Markets have changed and in trading we must employ ways of reading price that are grounded in the way the modern markets work. There are only few things that can be proven or are true about the markets. One of these is the existence of algorithms working on all time frames, in high volume markets, and their observable effects on price. I am not talking about HFT (High Frequency Trading) here. Those work only on the smaller timeframes and there is really nothing we can do about them. Can we leverage that and obtain a edge that can significantly improve our rate of success? Yes we can. And anyone can once the rules to model effects of algos on price are known. Have a look at how in the brief summary of this webinar. If you haven’t had the time and the opportunity to watch the webinar just yet, do it. It’s an eye opener. I had people very excited coming to me after the Toronto MoneyShow Workshop. Watch the webinar recording here, and then let me know what you think about it. 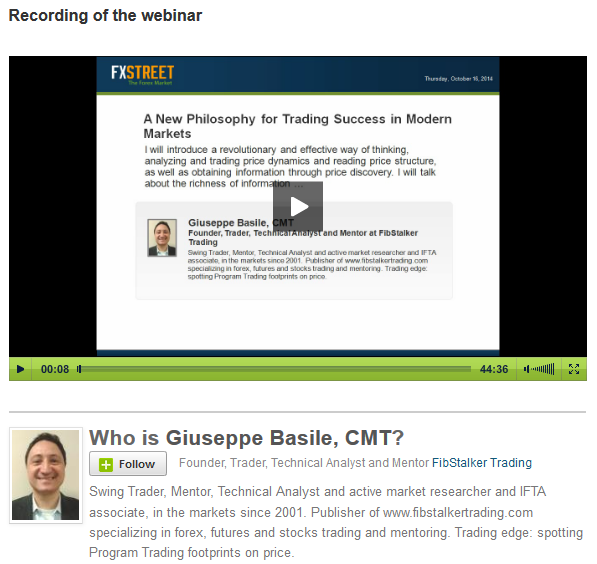 The webinar I offered in Yesterday morning at FXStreet.com is now available for you to view at your own convenience and time. 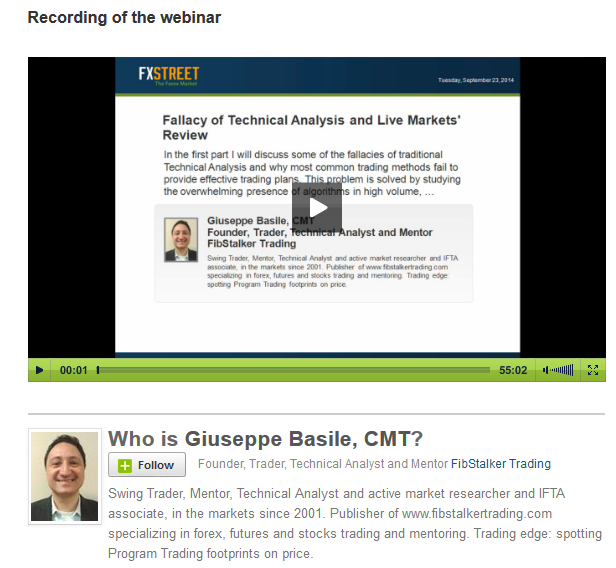 Find the recording of “Fallacy of Technical Analysis” Webinar here. I promise, you will find this webinar not only very informative, but it will catch your attention (especially when I tell attendees that “statistically they are all losers, plus they are gamblers” 🙂 ). This webinar may well also be the firs step of your transformational journey towards successful trading. If you do not believe it, just watch it, and come back to me. Otherwise, just take the “blue pill” and continue using and trying to make traditional Technical Analysis work. hope things are going well and your week is going well. I am preparing my next Webinar that I will be offering next week on Tuesday September 23rd on FXStreet.com, the largest global Forex portal. If you are looking at a different and effective way of looking at the markets, and wonder why you often are in the red with your trades, or you just want to bring your risk management to the next level, then next week’s webinar may be for you. 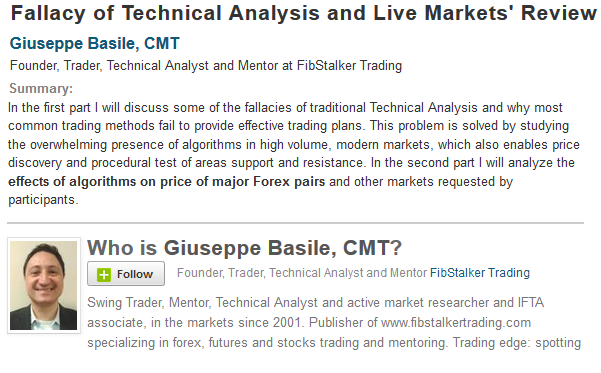 I will be talking about the Fallacies of Technical Analysis and how looking at Algorithms Footprints, my own trading edge, as well as using the FibStalker Methods can dramatically help improving your trading results. I am happy I will have the opportunity to share some of my research, which has practical impacts on my analysis and trading, and I firmly believe it can help you in your trading journey. The webinar will be next Tuesday September 18, 2014 12:00 GMT (8am Toronto time). I hope you enjoy it, along with its fresh and useful information. This webinar will be dense of “HAHA” moments, and I am sure you will learn a lot and even develop a different view and more insights on markets’ price structure and why traditional Technical Analysis will not make you successful.